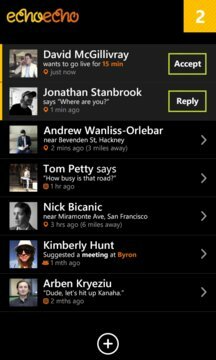 Finally the long awaited updated with avatars for your friends, a completely redesigned interface - optional LIVE tracking and many other features. A lot of you have been asking for this - and here it is. Echoecho is the simplest answer to the world’s most-texted question: Where are you? With just one click, you can see where your friends are. Or tell them where you are. For free. Simply tap anyone in your address book to say "Where are you?" When they accept, Echoecho shows you a map of where you both are. If they’re nearby, the Meeting Places function can help you choose a bar, coffee shop or restaurant to meet up. And the free and fast in-app chat helps you make plans or find out what your friends are up to. It doesn’t even matter what phone your friends have - echoecho works on all platforms. And if your friends don’t have the app yet? No problem: the echoecho invitation can be sent directly via text. 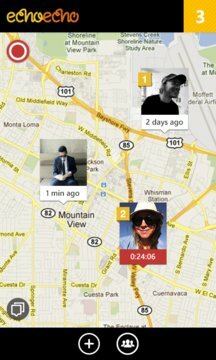 Our new Webecho feature allows your friends to share where they are even without downloading the app. So you’ll always be able to find each other within moments. There are no networks to join, and no profiles to create. It’s free, easy to use and you stay in control. No one ever sees where you are unless you allow them and you can’t track other people without their knowledge. So you can always choose what you want, depending on the situation. Whether you’re going out, shopping, heading for a meeting or just can’t find your friends on a busy street, echoecho means everyone’s now just a click away. Available on all smartphone platforms worldwide.